As Muslims living in this country, we have been subjected to various trials and tribulations as evident in the history. Often times, we have overcome these trials by adhering to Islamic guidance during adversities, that are based on the etiquettes of forbearance and tolerance. Those who have unwavering faith in Allahu Tha’ala would definitely emerge victorious from their hardships and the lives of Prophets of Allahu Tha’ala provide irrefutable testimony for this universal fact. While being patient, we also should refrain from cardinal sins whilst strengthening our connection with The Sustainer. Glorious Month of Ramadhaan that is foreclosing on us provides an excellent opportunity for this spiritual drill for believers. Without a shred of doubt, virtuous deeds of the pious would definitely ward off calamities and bring peace and prosperity to the country. 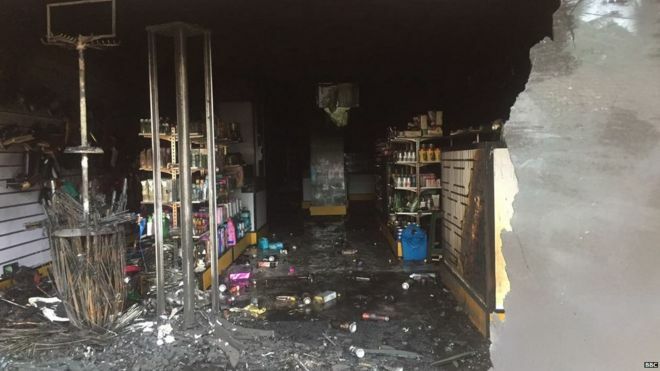 Naturally, the Muslims & the other minorities of Sri Lanka have become despondent and restive due to the present situation prevailing in the country as certain venomous elements continue to openly lunge to provoke racism. These kinds of despicable attempts, unleashed against a peace loving communities in the country, only would undermine the development of the nation along with germinating mistrust and hostility among communities. Above all it is a clear violation of the basic rights solemnly pledged to the subjects by the very Constitution. However, the All Ceylon Jamiyyathul Ulama (ACJU) requests the Muslims all over the island to perform virtuous deeds such as Salah (prayer), Isthighfar(repentance), Sadaka (charity), Soum (fasting) Dua (supplication) and Sabr (patience) while reciting Kunooth An-Naazila in all the obligatory five time prayers until the commencement of Ramadhaan. Additionally, the ACJU requests the Ulama, professionals and intellects as well as the community leaders to make collective efforts to eliminate the racism in a peaceful manner and to create awareness among the Muslim community of the fruitfulness of being tolerant and of turning more and more towards Allahu Tha’ala rather than succumbing to emotions and resorting to materialistic efforts. Let us all peace loving Sri Lankans strive towards strengthening bonds of peace & coexistence of this Nation. May Allahu Tha’ala overwhelm the evil agendas of the villainous elements and bless all the communities to live in peace and harmony. நாட்டு நிலைமைகள் சீராகி சமாதானமும் சகவாழ்வும் நிலவ அல்லாஹ்விடம் பிரார்த்திப்போம்! நாட்டு நிலைமைகள் சீராகி சமாதானமும் சகவாழ்வும் நிலவ முனைப்புடன் செயற்பட்டு அதற்காக அல்லாஹ்விடம் பிரார்த்திப்போம்! இந்நாட்டில் முஸ்லிம்களாக வாழும் நாம் வரலாறு நெடுகிலும் பல சோதனைகளுக்கு முகங்கொடுத்து வந்துள்ளோம். இவற்றின்போது நாம் இஸ்லாமிய போதனைகளுக்கு ஏற்ப பொறுமையுடனும் நிதானமாகவும் செயற்பட்டு வெற்றிபெற்றுள்ளோம். சோதனைகளின் போது அல்லாஹ்வின் மீது நம்பிக்கை கொண்டு செயற்படுவோர் தனக்கு ஏற்படும் பிரச்சினைகளிலிருந்து நிச்சயம் ஈடேற்றம் பெறுவர். 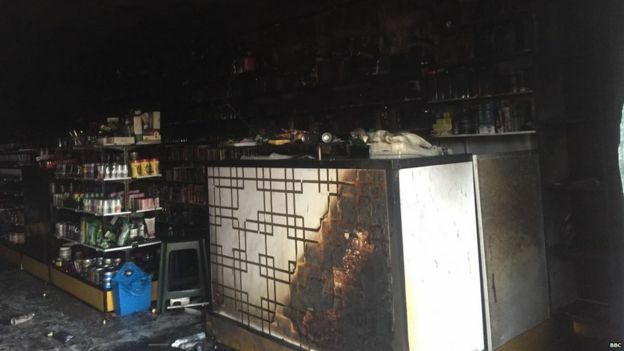 நபிமார்களின் வரலாறு இதற்குச் சான்றாகும். எனவே, முஸ்லிம்கள் பெரும்பாவங்களிலிருந்து தம்மைப் பாதுகாத்துக் கொள்வதிலும் அல்லாஹு தஆலாவுடனான தமது தொடர்பைச் சீராக்கிக் கொள்வதிலும் அதிக கவனம் செலுத்த வேண்டும். குறிப்பாக சில தினங்களில் எம்மை வந்தடையவுள்ள றமழான் மாதத்தில் நாம் அதிகளவு நல்லமல்களில் ஈடுபட வேண்டும். நிச்சயமாக நமது நல்லமல்கள் முஸ்லிம்களுக்கு குறிப்பாகவும் நாட்டு மக்களுக்கு பொதுவாகவும் நிம்மதியையும் சுபீட்சத்தையும் கொண்டு வரும் என்பது உறுதியான விடயமாகும். தற்போது நிலவிவரும் அசாதாரண நிலைமைகள் காரணமாக முஸ்லிம்கள் சற்று அமைதியிழந்து காணப்படுகின்றனர். சிலர் முஸ்லிம்களுக்கு எதிரான இனவாதத்தை தூண்டும் செயற்பாடுகளை தொடர்ந்தும் மேற்கொண்டு வருகின்றனர். ஒரு சமூகத்தை அச்சுறுத்தும் இவ்வாறான நடவடிக்கைகள், இந்நாட்டில் நிலவும் சமாதானத்தையும் சகவாழ்வையும் பாதித்து நாட்டின் அபிவிருத்திக்கு தடையாக அமைவதுடன், இந்நாட்டின் யாப்பு உறுதிப்படுத்தியுள்ள உரிமைகளை மீறும் செயற்பாடுகளாகவும் காணப்படுகின்றன. எனவே, இந்நாட்டு முஸ்லிம்கள் இஸ்லாமிய போதனைகளைப் பேணி, இன ஐக்கியத்தையும் சமூக ஒற்றுமையையும் பாதுகாக்கும் வகையில் நடந்து கொள்ளுமாறும், இஸ்திஃபார், ஸதகா, நோன்பு, துஆ போன்ற நல்லமல்களில் ஈடுபட்டு அல்லாஹ்வின் பக்கம் திரும்புமாறும் குனூத் அந்நாஸிலா ஓதுவதற்கான ஜம்இய்யாவின் வழிகாட்டல்களுக்கு ஏற்ப ஐவேளை தொழுகைகளிலும் குனூத் அந்நாஸிலாவை றமழான் மாதம் வரை ஓதுமாறும் அகில இலங்கை ஜம்இய்யதுல் உலமா கேட்டுக் கொள்கின்றது. அத்துடன் ஒவ்வொரு ஊரிலும் உள்ள உலமாக்களும் துறைசார்ந்தவர்களும் சமூகத் தலைவர்களும் ஒன்றிணைந்து இனவாதத்தை முறியடிக்க உரிய நடவடிக்கைகளை மேற்கொள்ளுமாறும், பொது மக்களுக்கு இதுதொடர்பில் வழிகாட்டுமாறும் ஜம்இய்யா வேண்டிக் கொள்கின்றது. நாட்டில் ஐக்கியம் மற்றும் சகவாழ்வு வளரவும் தீய சக்திகளின் மோசமான திட்டங்கள் தோல்வியுற்று அனைத்து சமூகங்களும் புரிந்துணர்வோடு வாழவும் எல்லாம் வல்ல அல்லாஹ் நல்லருள் பாலிப்பானாக. Note: Virtue is a cleanser and can remove the stains of sins. We often respond to a sin by putting ourselves in a figurative corner and abusing ourselves psychologically until we get over that sin. This is not what Allah Ta’ala wants from us. Yes, we should feel guilty, have a level of regret and MOST IMPORTANTLY repent, but it should not stop us from moving forwa rd in good deeds. People use their sins as an excuse to stay behind. Do not allow sin to stop yourself from all the other good that you could be involved in. The response to a sin should not be to wait, but rather to race to do something good so the sin can be erased. Our attitude should be proactive and positive. We should always have hope that Allah Ta’ala can, and will, have mercy on us as long as we keep struggling and pushing forward. Note: A husband is required to treat his wife with affection, respect her feelings, and show her kindness and consideration. It is the right of the wife to be treated well in all aspects of daily life. The husband should interact with her in a well-mannered way with a respectable attitude, sweet words and a smiling face. Being kind is indeed a pillar of strength that will fortify any marriage relationship. Remember being kind and respectful is more important that be ing right! A single harsh word can cause irreversible harm whereas a polite word could make her day! Note: Anger is a word, one letter short of Danger! It usually begins with madness and often results in regret. It is an emotion which if controlled, then the results will be positive. On the other hand if uncontrolled, then the outcome would be negative or detrimental. මුස්ලිම් ජාතිකයන් බහුතරයක් වෙසෙන රටවල් හතක වැසියන්ට ඇමෙරිකාවට ඇතුළුවීම තහනම් කරමින් දුන් විධායක නියෝගය නැවැත ස්ථාපිත කරන්නැයි ඉල්ලමින් ජනාධිපති ඩොනල්ඩ් ට්‍රම්ප් මහතා කළ අභියාචනය එරට අභියාචනාධිකරණය විසින් ප්‍රතික්ෂේප කරනු ලැබ තිබේ. මුස්ලිම් ජාතිකයන් බහුතරයක් වෙසෙන රටවල් හතක වැසියන්ට, ඇමෙරිකාවට පැමිණීම වළක්වමින්, ජනාධිපති ඩොනල්ඞ් ට්‍රම්ප් මහතා දුන් විධායක නියෝගය තාවකාලිකව අහෝසි කරමින් සියැටල්හි ෆෙඩරල් විනිසුරු ජේම්ස් රොබට්ස් මහතා සිකුරාදා (3) වාරණ නියෝගයක් පැනවීය. එම නියෝගය අභියෝගයට ලක් කරමින් අභියාචනාවක් ඉදිරිපත් කිරීමට ඇමෙරිකා නීතිපති දෙපාර්තමේන්තුව සෙනසුරාදා (4) කටයුතු කළේය. කෙසේ වෙතත් සඳුඳා (6) මේ කරුණු විමසීමක් සිදු කිරීමට නියමිතය. එහිදි සියලු පාර්ශවවලට කරුණු දැක්වීමට අවස්ථාව සැලසෙන බව ද විදෙස් මාධ්‍ය වාර්තා කළේය. සියැටල් විනිසුරු ජේම්ස් රොබ්ට්ස් මහතාගේ වාරණ නියෝගයට එරෙහි අභියාචනාව ඇමෙරිකා එක්සත් ජනපද නීතිපති දෙපාර්තමේන්තුව විසින් සෙනසුරාදා දිනයේදී ගොනු කරනු ලැබිණි. එම අභියාචනාවේ අභියාචකයන් වශයෙන් ජනාධිපති ඩොනල්ඞ් ට්‍රම්ප් මහතා, ඇමෙරිකා එක්සත් ජනපද වාසභූමි ආරක්ෂක ලේකම් කාර්යාල (හෝම්ලන්ඞ් සෙකියුරිටි) ලේකම් ජෝන් කෙලි මහතා සහ ආරක්ෂක ලේකම් රෙක්ස් තිලර්සන් මහතා නම් කර තිබේ. ජනාධිපති ඩොනල්ඞ් ට්‍රම්ප් මහතාගේ නියෝගය නිසා ඉරානය, සෝමාලියාව, සුඩානය, ලිබියාව, ඉරාකය සහ යේමනය යන රටවල් හයේ වැසියන්ට ඇමෙරිකාවට ඇතුළුවීම තහනම් කෙරුණු අතර සිරියාවට ද එම රටවල් ගොන්න අතරට ඇතුළත් කෙරුණි. සිරියානු සංක්‍රමණිකයන්ටද ඇමෙරිකාවට ඇතුළුවීමද තහනම් කරන ලදි. මෙම ලැයිස්තුවට පාකිස්තානය ඇතුළත් කිරීම සම්බන්ධයෙන් ද ජනාධිපති ඩොනල්ඩ් ට්‍රම්ප් මහතා සලකා බලමින් සිටින බවද විදෙස් මාධ්‍ය වාර්තා කරයි. 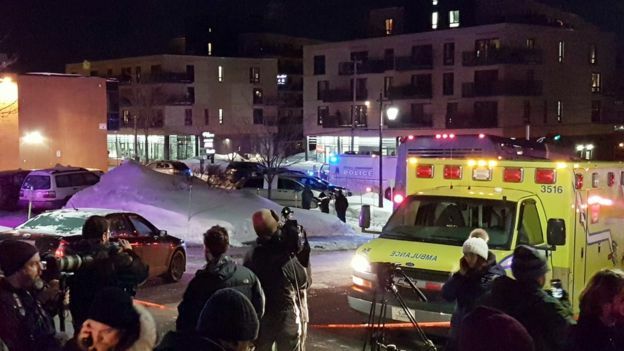 ix people have been killed and another eight wounded in a shooting at a mosque in Quebec City, Canada, police say. 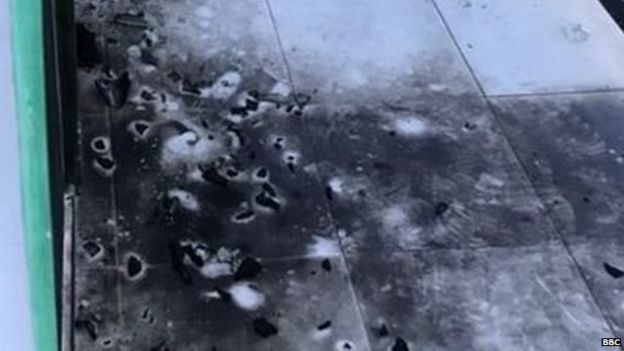 Shots were fired at the Quebec Islamic Cultural Centre on Sunday night, where more than 50 people had gathered for evening prayers. One suspect was arrested at the scene and another was arrested nearby. Police do not believe there are other suspects at large. The Canadian authorities are treating the shooting as a terror attack. "We condemn this terrorist attack on Muslims in a centre of worship and refuge," Prime Minister Justin Trudeau said in a statement. "Muslim-Canadians are an important part of our national fabric, and these senseless acts have no place in our communities, cities and country." 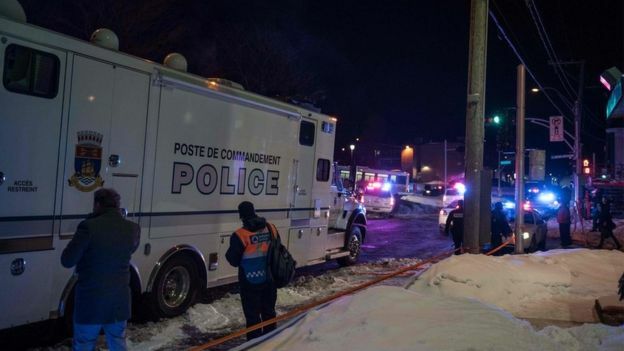 Quebec Premier Philippe Couillard also referred to the shooting as a terrorist attack. The dead were aged between about 35 and 70 years old, police spokeswoman Christine Coulombe said. Some of those injured were in a serious condition, she said. Police said the area was secure and the situation was "under control". Thirty-nine people had left the mosque safely, they said. Earlier, a witness had told Reuters news agency that up to three gunmen had been involved. The news agency also reported that a "heavily armed police tactical squad" had been seen entering the mosque. The second suspect fled the scene in a vehicle but was arrested on a bridge leading to Orleans Island, the Journal de Quebec reported. The suspect had called the police himself, the newspaper said. Police seized automatic weapons and handguns from the alleged attackers, the Journal de Quebec said. 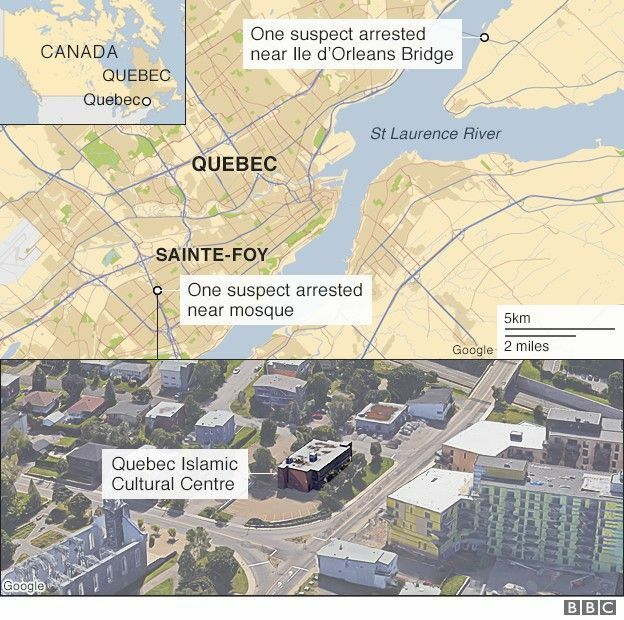 The president of the mosque, Mohamed Yangui - who was not inside at the time - said the shooting had happened in the men's section of the mosque. "Why is this happening here? This is barbaric," he said. On its Facebook page the centre thanked the public "for the hundreds of messages of compassion". In June last year the same mosque was the target of an Islamophobic incident when a pig's head was left in front of the building, with a card saying "bonne appetit". Eating pork is forbidden in Islam. විල්පත්තුව ජාතික වනෝද්‍යානයට පසුගිය කාලයේ හානි සිදුව ඇති බවට ඇතැම් පරිසරවේදින් යැයි කියා ගන්නා පිරිස් සිදුකර ඇත්තේ මාධ්‍ය සංදර්ශණයක් බව ලංකා සොබා සාමුහිකයේ සභාපති තිලක් කාරියවසම් මහතා පවසයි. තිලක් කාරියවසම් මහතා මේ බව පවසා සිටියේ විල්පත්තුව ජාතික වනෝද්‍යානය ආසන්නයේ කර ඇති නැවත පදිංචි කිරිම් තුළින් විල්පත්තුවට හානියක් සිදුව ඇතිද යන්න සොයා බැලිමට පුරවැසි බලය සම කැදවුම්කරුවන් වන සමන් රත්න ප්‍රිය , ගාමිණි වියන්ගොඩ මහත්වරුන් හා සෞඛ්‍ය , වරාය, දුම්රිය ,රජයේ කර්මාන්ත ශාලා සේවක සංගමය , ඇතුළු වෘත්තිය සමිති එකමුතුවේ ක්‍රියාකාරින් සමග විල්පත්තුවේ කළ සංචාරයකින් පසු මාධ්‍යයට අදහස් දක්වමිනි. මෙම සංචාරයේදී ලංකා සොබා සාමුහිකයේ තිලක් කාරියවසම් මහතා විසින් සංචාරයට එක්ව සිටි වෘත්තිය නියෝජිතයින් ට පවසා සිටියේ ඇතැම් මාධ්‍ය මගින් හා පරිසරවේදින් සමග භික්ෂුන් වහන්සේලා පිරිසක් දිගින් දිගටම රිෂාඩ් බදුර්දින් ඇමතිවරයාට පහර ගැසිමේ අරමුනින් විල්පත්තුවට හානි කර ඇති බවට ප්‍රචාර ගෙනයන බවයි. 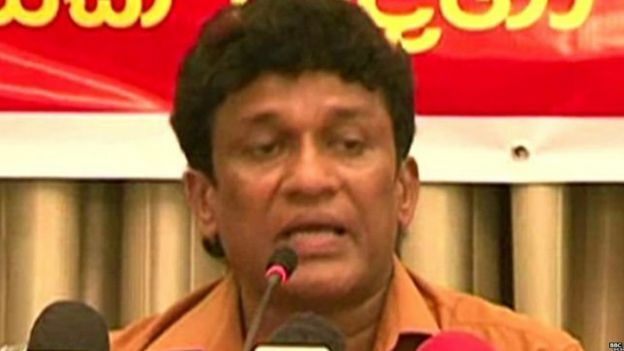 එසේ ඇතමුන් කරන ප්‍රකාශ වල කිසිදු සත්‍යතාවයක් නොමැති බවත් පැවසු තිලක් කාරියවසම් මහතා මේ වන විට විල්පත්තුව ජාතික වනෝද්‍යානයට කිසිම ආකාරයකින් හානියක් වි නොමැති බවට තමන්ට සහතිකයක් දිය හැකි බවයි. තමන් මෙම ප්‍රදේශ වල ඉන්දියන් හමුදා පැමිනි කාලයේ සිට නිතර පැමිනි බවත් එල්.ටි.ටි.ඊ . සංවිධානය මුස්ලිම් වරුන් එලවා දැමිමේන් පසු නැවත පැමිනේන විට එම ප්‍රදේශ දැවැන්ත වන ගහණයකින් වැසි තිබු බවත් එවා එළි පෙහෙළි කිරිමේදි ඇතැම් පිරිස් වන විනාශයක් ලෙස සලකා විල්පත්තුව විනාශ කරන බවට හඩ නගන බවත් තිලක් කාරියවසම් මහතා පැවසීය. My interest in writing this opinion is solely in relation to the Rule of Law (ROL) and its application in post-conflict Sri Lanka. There were promises echoed from the stages of both the Presidential and General elections with much hype, to transform Sri Lanka into an exemplary nation. Nearly two years after, even a semblance of this looks a distant mirage? Courage, bravery, impartiality and the real character of patriotism. For the sake of brevity, I will confine myself only to the first of these three i.e. Buddhism. As far as Buddhism is concerned the excellence of it’s teachings is well known worldwide. What is not equally known is the irreparable damage that is being done to Buddhism. There have been several scholarly opinions expressed in the Colombo Telegraph time and again, mostly written by Sinhala Buddhists. Almost all of which expressing concern on the same lines namely, the damage being perpetrated on Buddhism. Strangely, not by any non-Buddhist but by the Buddhists themselves. More so, by some of those who have chosen to adopt the strictures of Buddha and donned the saffron robe. Are these monks alone? Nay, they are ably supported by the cohorts within the bureaucracy and those outside. Evidently for their selfish political gains and, the cunning foxes among them, eyeing greater political ambitions in the future. Racialist nationalism and buddhism are opportunistic slogans used by these so called ‘patriots’ and ‘saviours’. The Rule of Law for such elements is an obstacle. Is Buddha A Prophet Of Islam? This is a subject of much intellectual debate and scholarship. I must make mention of this in passing. Some may feel uneasy or even jealous arising from a sense of possessiveness that a Muslim is writing about Buddhism. Be aware that Buddhism is a universal message and not the private property of the Sinhalese. I love Buddhism and I love the Buddhism in it’s original form. I, obviously, do not love the corrupted version of Buddhism as it is commonly being practised today. My love for Buddhism stems from my adherence to Islam. It teaches that to every nation messengers and reformers have been sent at different times. Such Reformers preached what was suitable for that time and for those people. Note the last sentence, ‘Messengers We have mentioned to you before, and Messengers We have not mentioned to you’. A subject under study is if Buddha can be among one such Reformer who has not been mentioned but was Awakened to guide and reform mankind. Most of what he preached within the context of his time is in harmony with the progressive teachings of Islam. The final Reformer being Prophet Muhammed (Peace be upon him). This is, however, a totally different subject which can be dealt with on a later occasion. It would be really humorous to think of a group of Congressmen writing a letter to their President, Barrack Obama, requesting him to take into custody and charge a suspect for inciting hate. Sadly, what would be considered a joke in the United States of America is a reality in Sri Lanka. Last month, (2nd December 2016) a letter was addressed to President Maithripala Sirisena signed by twenty one Muslim Parliamentarians requesting him “to take all extremists who are causing hate amongst communities into custody and charge them for inciting hate.” Does this action of the Members of Parliament demonstrate the absence of the normal standards of the Rule of Law? Something is amiss to require the intervention of the Chief Executive of the country over a simple investigation and prosecutorial matter. What is clear from this is the environment of impunity that has been created by the politicization of the Executive by successive governments. Wither the Rule of Law. In the absence of ROL chaos reigns and democracy diminishes. The virtues of the Noble Eightfold Path are very well known to the monks than to the layman. Despite this, it is alleged that Ampitiye Sumanarathana, a monk, by his conduct has either directly or indirectly brought disrepute to Buddha, Buddhism and to the respected venerable monks in the most offensive and disparaging manner. He is perceived by many to have violated these virtues by spewing out hate filled, abusive and derogatory words against another human being. The essence of Pancha Sila (five virtues) is boundless compassion (metta). One of the virtues of the pancha sila is to abstain from killing (Panatipata). Monks take this pledge daily and also asseverates this virtue to the laymen everyday. It was shocking to see a monk who utters “Panatipata veramani sikkhapadam samadiyami: I undertake the precept to refrain from destroying living creatures”, threatening a government servant saying, “I will kill you”. Ironically, in the presence of the Police who are also government servants. Reflect for a while at the Sila (purity of conduct) Samadhi (Tranquility) and Panna (Insightful wisdom) of this monk. (see video: CT, 12.11.2016). How many times would he have hypocritically mentioned “Sabbe satta bhavantu sukhitatta” (May all beings be happy) in Metta Bhavana (Loving-Kindness meditation)? Who is bringing disrepute to, and destruction of, Buddhism? Were the laws of this land relaxed just because he is a monk? Does wearing the saffron robe entitle one to make threats against the life of another citizen? Do they enjoy the status of primus inter pares (first among equals) and have stationed themselves beyond justice? Sarcasm would have it that the traditional concept of Separation of Powers be reviewed to include these unbuddistic monks as a new entity along with the Legislative, Executive and the Judiciary. Here comes the nexus between Buddhism and the ROL. Article 9 of the Constitution? “… it shall be the duty of the State to protect and foster the Buddha Sasana…”. The Police Ordinance Section 79 (2)? “Any person who in any public place or at any public meeting uses threatening, abusive or insulting words or behaviour ……., shall be guilty of an offence under this section”. The Prevention of Terrorism Act Section 2 (1)(h)? “Any person by words either spoken …………. causes or intends to cause commission of acts of violence or religious, racial or communal disharmony or feelings of ill-will or hostility between different communities or racial or religious groups …. Shall be guilty of an offence”. The several Penal Code provisions relating to hate speech, threat of injury to Public Officer, criminal intimidation etc. all of which are offences. Dear Mr. President and Mr. Prime Minister, what happened to that passionate election pledge that the Rule of Law shall be established?